Finance is one industry that is very strong across most American cities with many job options that pay extremely well compared to median salaries. Read more to find out about the cities with the largest job markets and the fastest growing job markets. Also explore the county by county data in the interactive map at the bottom, where you can explore the regional differences in job growth rates, raises, income, and number of people employed in companies in the financial sector. These cities generally align with the major financial areas that you typically think of for finance. NYC has Wall Street. Chicago has commodities and is the heart of trade for the center of the country. Los Angeles, Phoenix, and Dallas are corporate centers with many financial companies supporting. 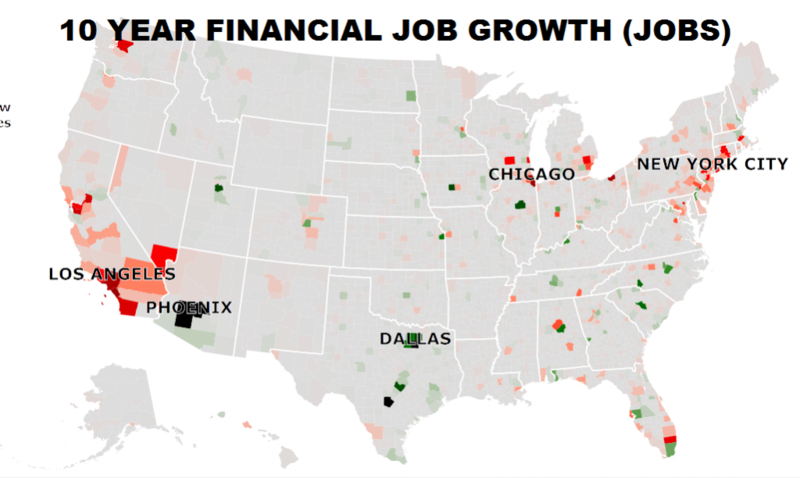 While these cities currently have the most jobs, they aren’t all growing. So these cities might have healthy financial sectors today, in the future other cities lower in the list may grow past them. Many of the cities in the top 5 such as Chicago and Los Angeles have seen substantial drops in financial sector employment over the past 10 years. Keep reading to find out where the up and coming cities are. Financial sector jobs have seen declines in many major areas. Texas dominates the counties with the largest nominal increases in employment in the financial sector with 3 of the top 5 counties with job growth over the past 10 years. With greater job growth comes greater opportunity to move companies for increased pay and responsibilities that you might not be able to get in more stagnant markets. While Texas dominates the raw growth by number of jobs, the fastest growing counties by annual % job growth are spread all over the country in smaller cities. It may be good to launch your career in a smaller market that is growing fast. Sometimes it’s better to be a big fish in a small but growing pond than a big fish in a large shrinking pond. The source for this data is from the Bureau of Labor Statistics. Previous PostPossible changes to Scottrade after the merger to TD AmeritradeNext PostHow much of the US could the top 1% buy?